Growing up in Sinks Grove, WV, seems like a light year away but the memories don’t fade, they really become more vivid as I become one of those “seniors”. I remember the people the most and some of the great times we had together, their faces are as clear to me now as when I saw them on a regular basis. We all came to Union from different parts of the county, some from Union, Sinks Grove, GapMills, Hollywood, Second Creek, Salt Sulphur, Wolf Creek and Flat Mountain. One weekend Lewis Scott, Ann Porterfield, Linda Carol Anderson and I decided to explore a cliff on Flat Mountain. We left from Ann’s house in Scott Hollow, the weather was hot and we walked a long way through the woods and briers and finally ….there was the cliff. Lewis and I decided to climb the wall… I think that Lewis fell and knocked me off the cliff with him, and we both landed in the brush. Linda and Ann were both scratched up from the briers and Ann’s mother was fit to be tied when we finally found our way back. They may not even remember that day but I sure do. 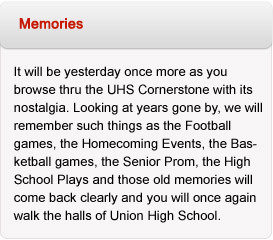 I think a lot about the guys I played football and baseball with at Union High School…those were wonderful days and some pretty tough days as well. I will never forget the night we all got new white football uniforms to wear and I got blood on Dale Hinkle’s pants….he was pretty upset. Noah Carter got the skin peeled off of his nose, the skin was hanging down and I still remember how that looked…. and Coach Houchins just took his handkerchief and rubbed it and sent him back in the game…..said something about “not whining”… I think. We were more afraid of the coach than we were of getting hurt. I think we won that game. I broke my knee on the kick off against Greenbrier High and played until halftime….just seemed like the right thing to do. fun we all had…boy, those parties were the perfect opportunity to spend quality time with that significant other, if you know what I mean. The weekends we made apple cider for fund raisers were also great times. I think that most of my time away from school was spent either with Joe or Noah. Noah and I got a job catching chickens for Wheeler Weikle at night and loading the truck. We would catch four each and put eight in a crate. What a freakin’ job…the dust alone was a health hazard. I also remember helping David Sizemore milk at George Iron’s dairy farm before school, we always had a little something hidden in the barn to keep away any chills. Ha! There are a million memories from those days. A lot of water has flowed under our bridges since those days. Times have changed to say the least, we are older and hopefully wiser. Life has been very good to some and very difficult for others. Some are no longer with us, but for those of us who remain, there is a bond that will be there as long as we live. I am very grateful to have been raised and schooled in such a wonderful part of the country….the values I have learned will be with me forever.